Make Money With Google AdSense ! 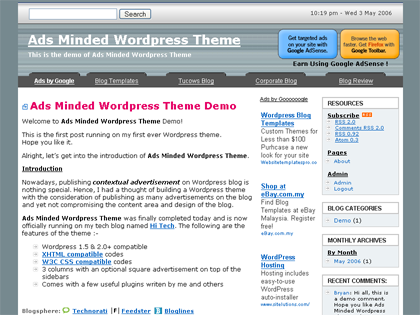 Welcome to Ads Minded WordPress Theme Demo! This is the first post running on my first ever WordPress theme. Nowadays, publishing contextual advertisement on WordPress blog is nothing special. Hence, I had a thought of building a WordPress theme with the consideration of publishing as many advertisements on the blog and yet not compromising the content area and design of the blog. Copyright © 2006 Ads Minded Wordpress Theme.